An absolutely beautiful day out yesterday and I took advantage of it to flock and seal the Terminators and Contemptors - two more units complete! I absolutely love the Cataphractii models, they are some of the best infantry models that FW has done in my opinion. 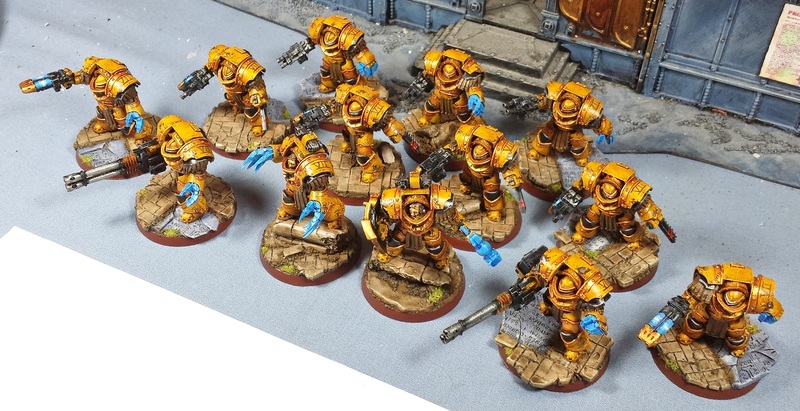 I went with one of the paint schemes laid out in Extermination - primarily yellow with the black veteran panels on the under-shoulders, knees and gorget and a fair bit of gold trim. Tried the more-familiar-to-me sponge weathering technique on these guys, starting off with vallejo's Charred Brown then going in with a brush and some Boltgun Metal to pick out the interiors. Then a little Gold Yellow on the lower edges to try and give it a bit more of a 3D look. Still not totally comfortable with my weathering on infantry models - practice makes perfect though, gotta keep trying things to see what works! 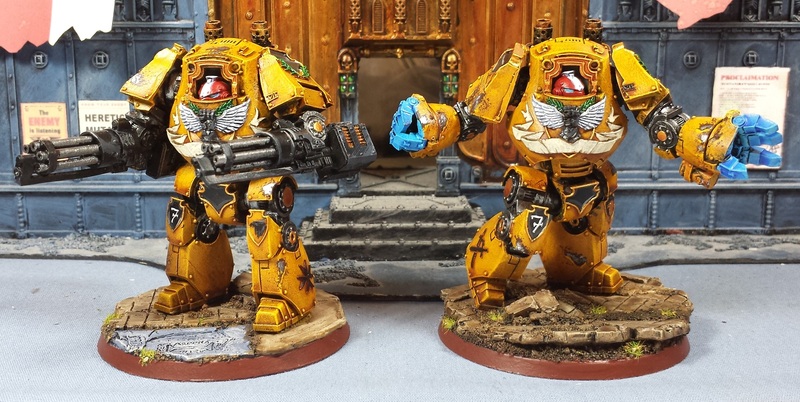 I didn't have any Imperial Fists waterslide transfers small enough to fit anywhere on the models, so I just added some 7th legion numbers on the shoulder pads. Might revisit the decorations later if I can come up with a decent idea. Overall however, I'm pretty pleased with how they turned out! 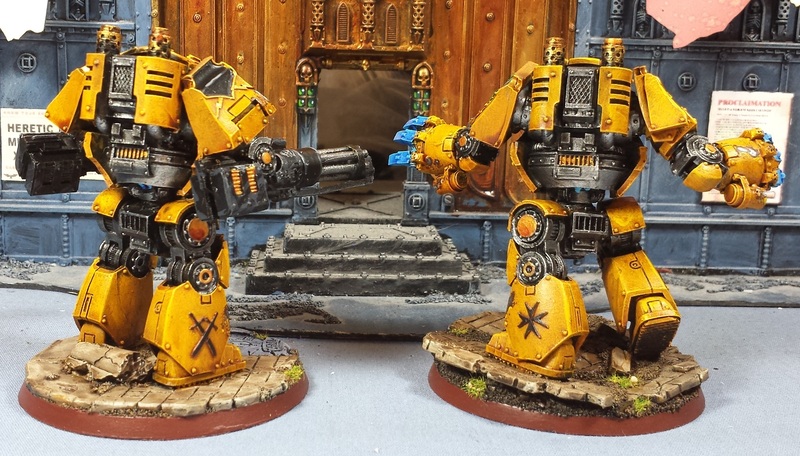 Next up are the two Contemptor dreads. I absolutely love the models both from the posing options and just how nasty they are on the tabletop! The sponge weathering is much more convincing at this scale I find - just a little more area to work with makes all the difference (or at least it does with my fists of ham)! Didn't get any painting in yesterday but in between chores and errands I did knock together the trio of Deimos Rhinos that have been lurking in the Closet of Doom since the Iron Hands army - Never got around to building them for that army, nor the Thousand Sons, but they finally will get their time in the sun! Definitely want to test out the Fists paint scheme on some basic Rhinos before committing to the Land Raiders and Sicarans! Damn mate, you're a painting machine. 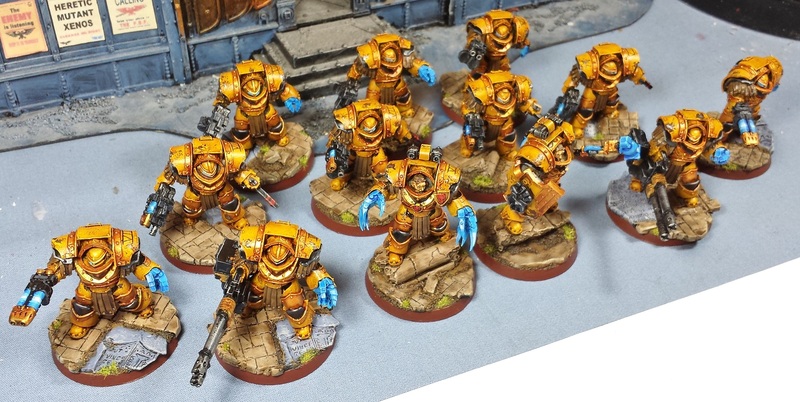 The Cat termis look great, and I didn't even notice the lack of chapter/legion symbol til you pointed it out. They look bloody brilliant. I love the blue as the spot colour for power weapons etc. It shouldn't work but it really does! If you get what I mean. Like I said before, I think these are some of your best work. Lovin' these dude! They look great and the blue makes them pop nicely. You put my progress to shame! @Colonel Winterborne: Cheers man! I really appreciate that. @Anurien: Yeah, Nachos didn't exist in latin, so I went with "Crispy Cheese". Hah! Great work, these look fantastic. The colour combination really pops out, & the bases gel excellently with the figures. Cripes! So much good stuff! The Contemptors came out amazingly! It could be his war cry, perhaps ? He still looks great. Still astounded by the speed you are putting this together to be honest. Loving the yellow you are getting out of them as well. But how do you manage to paint that quickly? @Pawn Cocktail: Thanks very much! @Rory Priest: Thanks! I try to get an hour or so of painting time in each day, and the batch painting method means that though it's just a couple colors a session after a week or so they're suddenly all done! Those look awesome. The toned down bases also look much better. You're pumping these out at an astonishing rate and they look great. My favourite of your armies so far.